Arch Canyon is a fun trail with outstanding scenery. This trail starts out from Comb Wash a few miles north from Highway 95. It stays in the bottom of Arch Canyon the whole way and crosses the creek a number of times. The day we ran the trail it had rained all night, so the crossings were deep early in the day. Normally the creek crossings are not very deep. Near the beginning of the trail are some Anasazi ruins that are pretty cool to check out. Once at the end of the trail there is a nice primitive camping area and the beginning of a hiking trail that takes you past Cathedral Arch and to Angel Arch. The hike is well worth it. You can combine this trail with Hotel Rock for an excellent weekend of exploring. Plus, there are numerous Anasazi ruins in this area near Comb Ridge that you can spend a lot of time exploring. Please feel free to leave your comments and post your pictures from Arch Canyon below. Open file above in Google Earth. This entry was posted on Tuesday, June 24th, 2008 at 6:35 amand is filed under . You can follow any responses to this entry through the RSS 2.0 feed. Both comments and pings are currently closed. 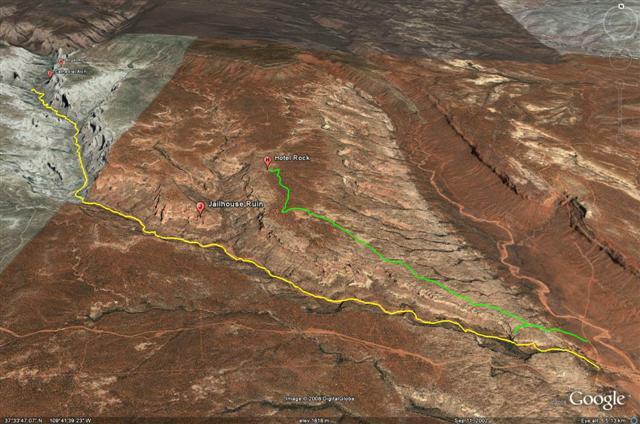 Google Earth track and map updated.